Mansion Poker On Line Poker Twister Poker Madness!!! For more promotions check our Mansion Poker promotion page. Based in Gibraltar, Mansion Poker has been providing the public with flawless online poker services since 2004. Originally a standalone poker room which enticed player traffic with an excellent customer service, Mansion decided to give up its independence and join the iPoker network in hopes of gaining access to better player traffic and better action. Funded by a group of private investors, Mansion Poker is one of the few online gaming operations which has access to and is allowed to advertise on the UK market. Gibraltar is a prime location for such offshore enterprises, its regulatory framework a sturdy one, it offers excellent credibility and honesty standards. The poker room promotes a policy of full transparency towards the press and all comers for that matter. Mansion Poker’s current software is provided by iPoker, and given the size of the iPoker network you probably already know what it’s like. The downloadable software features better (3D-like) graphics, and better response times, but the no-download version is excellent as well. Some problems with the iPoker software are: the annoying sound effects (but you can turn them off), the limited number of player avatars and the long response times allowed for players, which slow games down. The statistics available are the usual ones (average pot sizes, stack sizes etc) and players can take notes on their opponents. An interesting touch is the availability of in-game hotkeys. Multi tabling is available at 16 tables simultaneously, and the action remains fast and smooth even when you play at several tables. The controls are clearly visible in multi-table mini view, and thus multi tabling and bonus redemption is a cinch at Mansion Poker. If you sign up to Mansion Poker now, you’ll enjoy a 100% match on your first deposit, up to a pretty generous $600. Here’s what you need to know about your bonus details: it is valid for 90 days (roughly 3 months) after which you’ll have to forfeit it if you do not redeem it by then. Bonus redemption is done through the generation of Mansion Poker Points which is done through real money play. For every 80 MPPs that you generate, $10 of your bonus finds its way to your real money account. You can earn MPPs by playing in cash games (the number of MPPs you earn there is a function of the amount of rake generated) or tournaments. In a tournament, you get 5 MPPs for every $1 you pay out in tournament fees. Playing at Mansion Poker will also offer you a set of promotional benefits. You’ll be given the opportunity to play for a $22,600 ECOOP ticket and Premiership football tickets. You’ll play in high-buyin STTs, Jackpot SNGs, Happy Hours, Freerolls and other such excellent value perks. Refer your friend to Mansion Poker and get a $75 extra bonus. 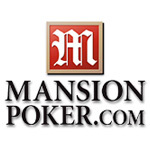 Mansion Poker features excellent tournament traffic. There are around 55,000 players at their tournament tables at peak hours, with most of this traffic focused on the low-to-medium buy-in tables. If you’re looking to start up a poker bankroll, you’ll be pleased to hear about all the freerolls Mansion Poker offers. There are $50 and $100 beginners’ freerolls in which you can play without any sort of buy-in required provided you signed up during the last 90 days. MPP freerolls do cost poker points to enter, but they provide much bigger prize-pools too, some of them go as high as $1,000. SNG specialists will be treated to a whole array of Jackpot SNGs. The Fort Knox Jackpot SNG’s offer prizes of at least $50,000 for the winners. These are all high-buy-in SNGs. If you’re looking for something less costly, the $25,000 Rio Jackpot SNGs, the $15,000 Maui Jackpot SNGs or the $2,000 Dirty Dozen SNGs are sure to meet your needs. MTT players will have plenty to root for too. Mansion Poker features qualifiers and gives away tickets to the ECOOP III. Mansion Poker offers quite a few outstanding attractions. Such attractions are the generous jackpots its special SNG tournaments offer for consecutive winners. The MPPs players gather through real money play can be used for a variety of purposes among which deposit and reload bonuses, which lend them extra value. The live event qualifiers that the site offers provide excellent EV (buy-in/potential return ratios). Players will be able to win special prizes, like ECOOP tickets and special events entries (like Premiership tickets). As far as the software goes, unique features are less abundant. I’d mention the in-game hotkeys here and the fact that the software supports automated export of all cash game and tournament data to PokerTracker for further analysis. Mansion Poker does not currently accept US players. As a matter of fact, the poker room has pretty much stuck to this policy for quite a while now, even though in the beginning, right after the UIGEA had been passed, it kept accepting American players for a while. As a result this, the poker room is definitely European oriented, with its promotions all aimed at a UK and EU clientele. The competition is relatively loose, in micro and low limit games the flops viewed percentages are often in the 35-40 range. High stakes games feature much tighter and tougher to beat competition though. Mansion Poker has always aimed to stand out from among all their competitors through their excellent support system, and they’ve been doing a pretty good job at it. Support is available through email, with reasonable response times, phone and fax. Most importantly, if you run into something urgent, you can get help via chat which costs you nothing and is about as instant as it gets.